Gretchen Kish Serrano creates beautiful custom pet portraits in three styles — brush, drip and gild. As a cat lover and an art lover, I was intrigued when I heard about artist Gretchen Kish Serrano and her custom pet portraits. Her pieces combine her creativity with inspirations from classic artists. 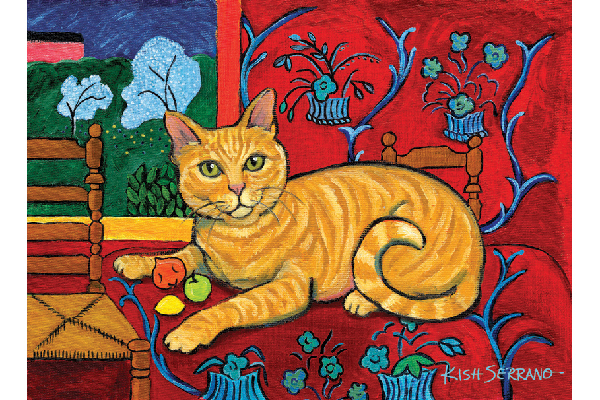 These vibrant works of art are not only beautiful, but they honor the bond her clients share with their pets. She specializes in cats and dogs, but she’s always open to commissioning other pets. Gretchen focuses on three distinct styles: brush (inspired by the thick brush strokes and bold color palettes of Vincent Van Gogh); drip (inspired by the expressionistic drips and splatters with bold, over- lapping colors and thick surface texture of Jackson Pollock); and gild (inspired by the gilded works of Gustav Klimt — to mirror this style, she gilds using 23 kt gold). 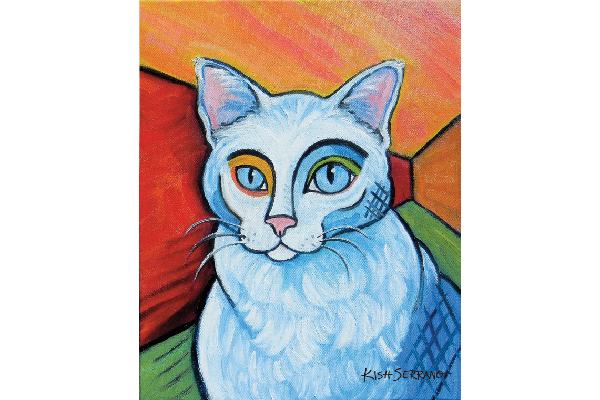 For over 10 years, Gretchen has been creating a pet collection of cats and dogs called Paw Palettes, for all pet lovers, furthering her studies of master artists and their techniques, while honing her own skills and passion for art. She loves how peaceful cats make her feel, along with their adventurous spirits. She once had a black cat named Siris, who would nap on her sun porch, looking so peaceful and content. “Petting him always relaxed me,” she says. Learn more about Gretchen at kishoriginal.com; on Instagram @kishoriginal; and on Facebook @pawpalettes.